Reg-Room, LLC provides regulatory information services, monitoring and consultancy to the financial services industry in the US and internationally. 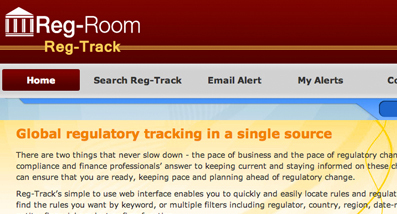 Reg-Room is pleased to provide Reg-Track our regulatory tracking system. The database identifies and summarizes the regulatory developments accross the financial services industry.Use our taxonomy to easily find the rules you want and to set up your own customized alerts. 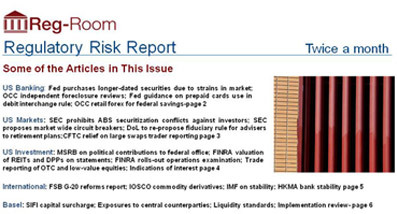 The report is published twice each month and delivered straight to your inbox. The report intelligently connects activity by different regulators on a single related topic in a way that saves the reader time and enables trends to be identified. Reg-Impact is used to manage rule assessments and compliance for your organization on a real-time basis. Daily rules based on their effective date. The calendar displays, in a monthly format, the individual rules that become effective on future days. 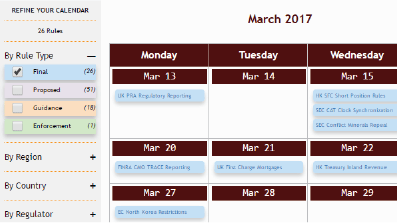 You can view either the current or future calendar months.